Why do I need ecommerce tracking? Only by using Google Analytics ecommerce tracking, can you match real sales data with website usage (including traffic source/medium). This sales analysis is required to understand the performance of your website landing pages and return-on-investment from marketing campaigns. 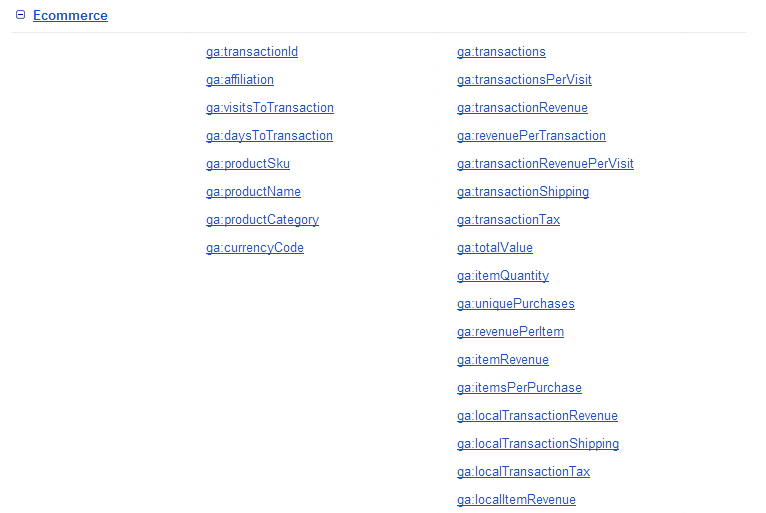 The ecommerce reports allow you to analyse purchase activity on your site or app. You can see which products were bought, average order value, ecommerce conversion rate, time to purchase, discount vouchers used and checkout process funnels. Ecommerce tracking is useful not just for online shops but for all kinds of websites including event booking, courses / education, travel / hotels and so on. Read how to Set up Ecommerce Tracking with Google Tag Manager. Which products sell well, and by inference, which products are best suited for your customer base. The revenue per transaction, and the number of products per transaction. For example, if the number of products per transaction is lower than you’d like, you might benefit from offering better quantity discounts, or offering free shipping if customers meet a minimum dollar amount. How long (in time and in the number of sessions) it takes customers to make the decision to purchase. If your sales cycle is stable or fluctuates predictably based on product or season, you can use this information (in conjunction with overall sales forecasts) to make reliable predictions about revenue. If customers routinely make numerous visits before they purchase, you might think about a site design that leads more easily to your purchase pages, or options that let users compare your products and prices to your competitors’. The difference between goals and ecommerce. A goal is only measured once in a visit. Think about it similar to pageviews vs. unique pageviews – once the goal has been ‘triggered’ to a visit, it can’t be triggered again. On the other hand, there are no limitations on the number of transactions being measured during one session. Ecommerce is more powerful in that it allows you to analyse additional metrics. For example, you can see how many visits occurred before the visitor decided to purchase. Many visitors on my site come back more than 7 times before they finally decide to purchase. Wow, interesting figures! If you have marketing campaigns and have no ecommerce tracking you are more likely struggling to calculate the return on your investment (ROI). With both goals and ecommerce tracking, you will now have a full understanding of your customer journey and your customer life value (CLV). Analytics goals vs. ecommerce transactions, which to choose? Both of them! If you have read my post carefully, you will understand that both of them have their strengths and limitations. We strongly advise to implement and configure goals and ecommerce. Need help configuring goals and/or ecommerce on Google Analytics? Get in touch with our experts!